It is everything right with the world. Or worlds. I mean, obviously, who doesn't love magic? But I love all the different kinds of magic you get, from the complicated hand movements of The Magicians to the Latin incantations of Harry Potter to the Threadwitchery of Truthwitch to the Wyrd marks of Throne of Glass. Seriously, though, fantasy books can take heavy real world issues and distill them into something people will swallow. Mudbloods, half-dragons, dwarves vs elves, Patrons and slaves--it's a microcosm of our world. Reading Harry Potter even makes kids more tolerant, at least for a bit! Are better than other guys. Why bother with the flirty dude at the bar when you have princes with glowing eyes, emotionally damaged magicians, sullen Dragons, and wizards in moving castles? Especially in the young adult world, fantasy has given us some stellar heroines. Celaena, the badass assassin who lets no one get in her way. Seraphina, the half-dragon whose cleverness and compassion save an empire. Sophie, the quiet force of nature. Hermione, the queen of all that is good and brilliant. There's nothing cooler than a magical castle. Maybe it has moving stairs, house elves, and poltergeists. Or elemental hearts, ala Cruel Beauty. Gardens of glass and doors to everywhere like The Star-Touched Queen. Secret tombs and passageways, as in Throne of Glass. Or maybe it's surrounded by a goblin city and an impenetrable labyrinth. Speaking of goblins, fantasy has given us some of the best beasties. And some of the scariest. Shelob, the GIANT FREAKING SPIDER. (Shout-out to Aragog.) Fire demons (<3 Calcifer). Tiny trinket dragons. Chaos wolves. And lovely Fizzgigs! Real-world villains are a'ight but fantasy villains could chew them into little pieces. There's Sauron and Voldemort, of course, but there's also the Darkling, who can manipulate shadows; the Witch of the Waste and her riddles; the lord of the pyramid who traps souls. This is such a great list! I found myself nodding along with almost all of your listed loves--especially enjoyed the "fantasy guys," "fantasy girls," and "villains" prompts. Villains in particular are an addiction of mine! Thank you for sharing! 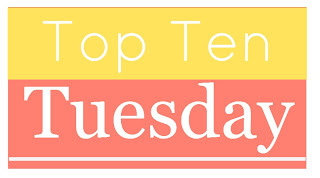 Here's my Top Ten Tuesday, if you're interested. Happy book-ing! Just started Uprooted and I love it!!! Such a great list! I'm still introducing myself to fantasy. I'm slowly working my way through the popular ones. I've read Shadow & Bone this year and I can definitely agree about the villains now that I've met The Darkling!! I have almost all of these on my TBR!